Team Fortress Comics #3 Is Here! Valve's bimonthly (plus Valve Time) comic is back and at 'em again with Team Fortress Comics #3: A Cold Day in Hell! The story starts off where we were last left, with Saxton Hale facing off against his arch-nemisis, Charles Darling. 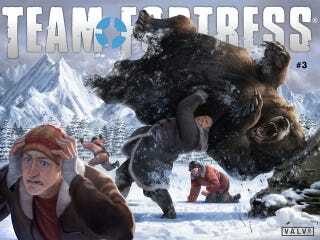 Pyro, Scout, and Soldier set off to find Heavy in the middle of Siberia, where Soldier runs into a foe of his own! Also featured in this episode: violence towards bears! But probably the best part of the comic is seeing everybody's favorite Heavy Weapons Guy at home with his family. Learning more about the big guy -other than his love for Sasha, Sandviches, and killing tiny baby men- is nice since we don't know too much about the lovable lug. It's quite a nice chapter to the comic. It's got plenty of humor, a nice bit of character development (for a goofy multiplayer FPS game), and a nice twist towards the end that brings back some old characters in unexpected ways. Let's just say the BLU Team isn't going to be unemployed for long either. You can read the full comic in the link above! Or if you reread the first two chapters or need a brush-up, issue One and Two are right here. Or if you just want to go through all of TF2 comics, go here. Happy reading! And I apologize in advance to the TAY bear community for the graphic depictions of violence towards your noble kind.